Click here to download the printable PDF of eNews 258. Fill the thermometer to the top with overflowing generosity! 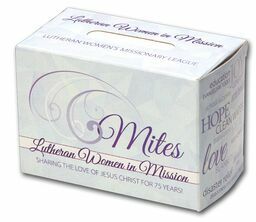 Fill your Mite Boxes and/or donate your gifts online at lwml.org/donate-online today! Please note — Friday, March 29 is the deadline for all mite offerings to be received in the LWML Office! The end of our biennium, March 31, falls on a Sunday this year so please make adjustments in your schedule for contributing to the Mission Grants for 2017–2019. 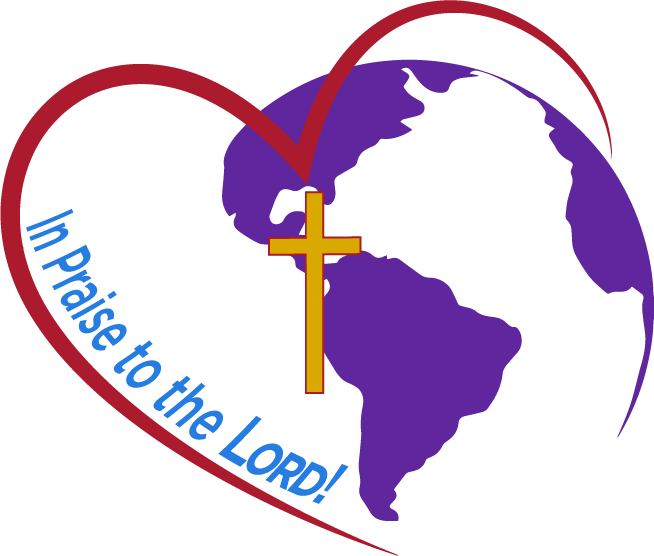 LeadaChild is a Lutheran Mission Agency, dedicated to sharing the Good News of Jesus’ love to children through Christian education in countries where many children are unable to attend school. Pastors and missionaries serving around the world send education project requests to LeadaChild, where their team of educators, pastors, and lay-people review each request. They provide aid to educational ministries that align with their goal of sharing the love of Jesus with children. 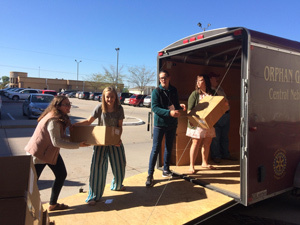 Educational scholarships for students, teacher training, curriculum resources, and promotional materials are provided at no cost to these ministries. Reallocated mission grant #22a will help support teacher training “hubs” in their schools already established in Liberia and other West African/Asian countries. 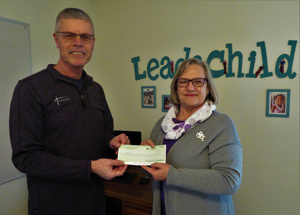 LWML Kansas District President Brenda Piester recently acknowledged her privilege of presenting a $30,000 check to the Executive Director of LeadaChild Dr. Philip Frusti at the organization’s office in Olathe, Kansas. Dr. Frusti said that the timing of the grant presentation was perfect in that they would be traveling to Africa in the next couple of months to really work on getting the teaching hubs established. Brenda said that Dr. Frusti thank her and the LWML more than once, and he expressed how grateful LeadaChild was for receiving this mission grant. To learn more about all 22 mission grants, click here: lwml.org/mission-grants. Pre-convention seminars will be offered on Thursday, June 20, 2019, at the Mobile Convention Center in Mobile, Alabama, for anyone willing to take this information back and share it with their district, zone, and local LWML groups. Reservations are required and should be made by an LWML District President. Deadline for sign-up on all seminars is May 25. Leadership Development: Become a Leader You Would Follow! This is an opportunity for you to gain knowledge of the resources available, ask questions, and interact with those from other districts who hold the same position or interest. A synopsis of each seminar is available here. All seminars will run from 9:30 a.m. - 11:30 a.m. The cost of each seminar is $20 and includes lunch and all materials. Districts will be invoiced after the convention for their district’s registrants. For more information and to register, contact your LWML District President now! Come one, Come all! Mobile has something for YOUth! Why wait? 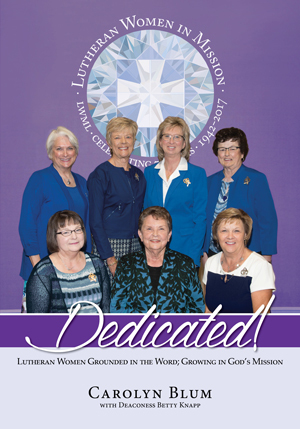 If you are ready to serve, we are ready to equip and engage you in participation in the LWML. All young ladies ages 12-17 (give or take a few years) are invited to participate in the Thursday Gifts from the Heart collection, a meet and greet, and a Friday evening activity sponsored by the LWML Committee on Young Women. Be sure to enroll in Camp Insta Friends High School Program for your daytime activity on Friday and Saturday. See page ‘O’ in the LWQ for the registration form, or click here to get the form from the YOUth in mission webpage. Spread the word. We will contact you after we get your registration. One generation shall commend your works to another, and shall declare your mighty acts (Psalm 145:4). This convention is ideal for multigenerational participation and fellowship. Let’s serve the Lord with gladness together. Begin in the Word with morning Bible studies from 6:45 – 7:45 a.m. on Friday & Saturday, June 21 & 22; led by accomplished LCMS men and women. Continue in God’s Word with convention Bible study led by acclaimed speaker and author Donna Pyle. To register and to read about all the joyful events offered in Mobile at the 2019 LWML Convention, visit lwml.org/2019-convention. She seeks wool and flax, and works with willing hands. She opens her hand to the poor and reaches out her hands to the needy (Proverbs 31:13, 20). The Ladies Aid at Zion Lutheran - Offerle was established October 19, 1921. 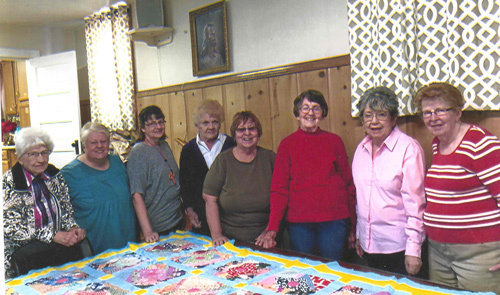 Zion Ladies Aid has been involved with quilt making for nearly 100 years. On the third Thursday of each month, ladies from Zion, along with a few other ladies in the community, gather at the church to make quilts. Two of the ladies (Wilma Lancaster and Marilyn Kersting) remember attending quilting days at Zion with their mothers. Various sizes of quilts are constructed, including baby, youth, and full size. Most the fabric is donated by church members and the community. The finished quilts are distributed to Lutheran World Relief, Orphan Grain Train, and Dakota Boys and Girls Ranch. Typically, 50 -70 quilts are completed annually. 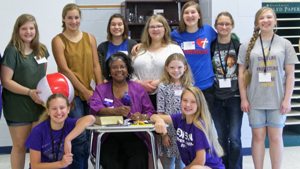 Pictured in photo (L-R): Wilma Lancaster, Sidney Hicks, Nancy Hattrup, Diana Wetzel, Laquita Kenke, Marilyn Kersting, Patsy Fredlake, and Linda Stegman. Dedicated! will be available soon to purchase in the online LWML Store at www.lwml.org and click on the “Shop” tab. It will also be sold in the LWML Store at the June 20 – 23, 2019 LWML Convention in Mobile, Alabama, where LWML Past Presidents and the author will be available to sign your copy. Consider purchasing an additional book for your LWML group or your church library; it would also be a great gift idea for your secret sister or your pastor.